In the first years of the millennium, tabbed web browsing became the norm. Overnight, browsing habits changed. Instead of struggling to manage multiple windows, users could open a dozen or more pages while researching. By contrast, eight years later, KDE’s fourth release series added tabs to all windows on the desktop — instead of just in Konsole — but most users have yet to discover this useful item. Part of the reason for the obscurity may be that, until recently, tabbed windows were supported only by Oxygen widgets; change the widgets in the System Settings > Application Appearance > Style, and the feature disappeared. You’ll find the tab option in the drop down menu on the left of the title bar. The good news is that In the most recent release, tabbed windows are independent of the widget style. The bad news, though, is that the feature is still hidden in the window menu on the left side of the title bar. From the window menu, you only need to choose to click Apply as tab to to attach the current window to any other open one, but, unfortunately, many users never venture into anywhere near the menu, which leaves tabbed windows imprisoned in obscurity. 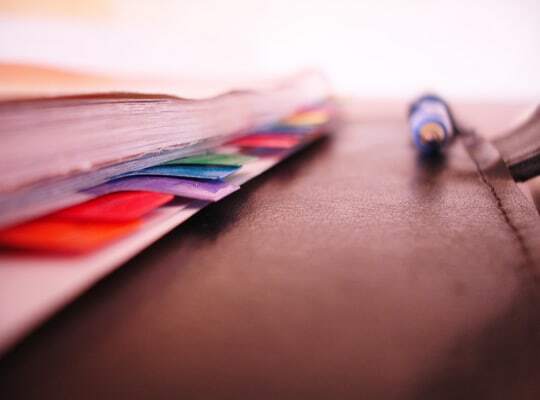 The main advantages to tabbed windows are similar to those for tabbed browsers: you have fewer windows open on the desktop, and you can arrange the applications you are using so that they are a single click away. For example, in writing an article, I frequently have open a text editor, several web pages, and a graphics editor for taking screen shots. Instead of fumbling back and forth between them, with tabbed windows, I know exactly where they are and can move between them without hesitation and without disturbing my thoughts. 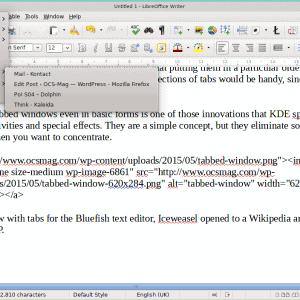 A KDE window with tabs for the Bluefish text editor, Iceweasel opened to a Wikipedia article on tabs, and GIMP. 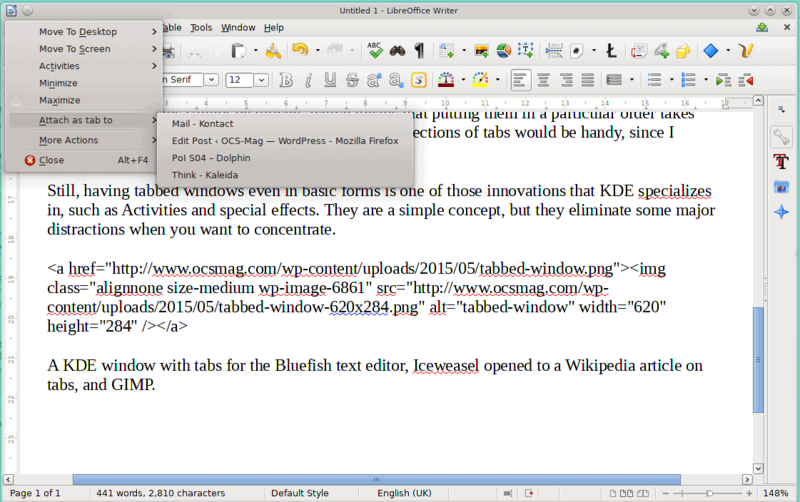 Of course, KDE’s tabbed windows suffer some of the same disadvantages as tabbed browsers. For example, if you include more than half a dozen tabs in the same windows, their labels are shortened into unreadability, eliminating much of their advantage. Nor are there plugins such as colored tabs to group tabs. In addition, the tabs cannot be moved, which means that putting them in a particular order takes some planning. Personally, too, the ability to save collections of tabs would be handy, since I frequently use the same ones together. 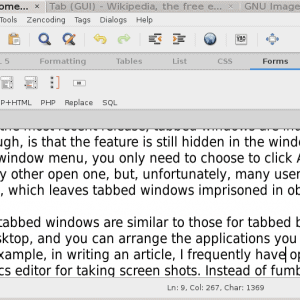 Still, having tabbed windows, even in basic forms, is one of those innovations that KDE specializes in, such as Activities and special effects. They are a simple concept, but they eliminate some major distractions when you want to concentrate.